​​​​​​​​​Sheet pans are having a moment. 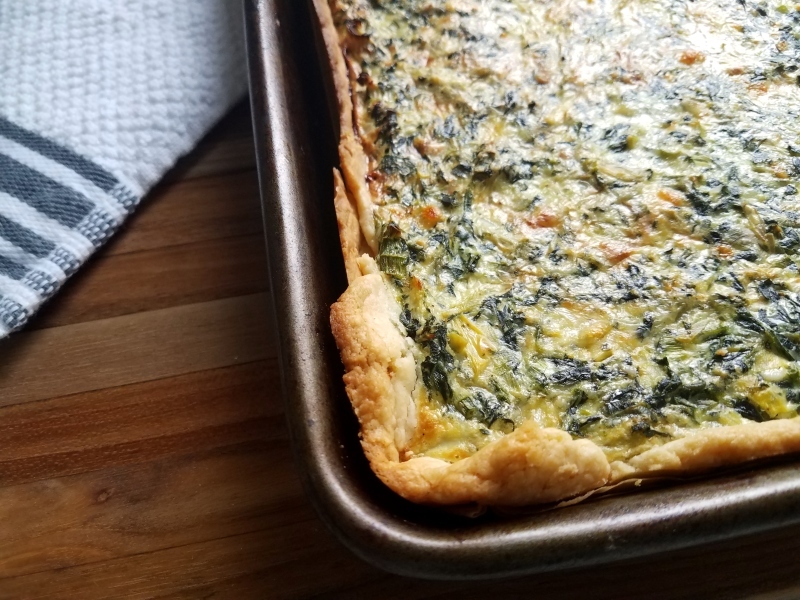 Whether it’s sheet pan frittatas, sheet pan pies, or sheet pan focaccia, there seem to be multitudes of recipes allowing you to scale recipes to fit in quarter or half sheet pans so that you can feed a crowd with less fuss. I first saw this concept applied to quiches on Deb Perelman’s Smitten Kitchen blog. 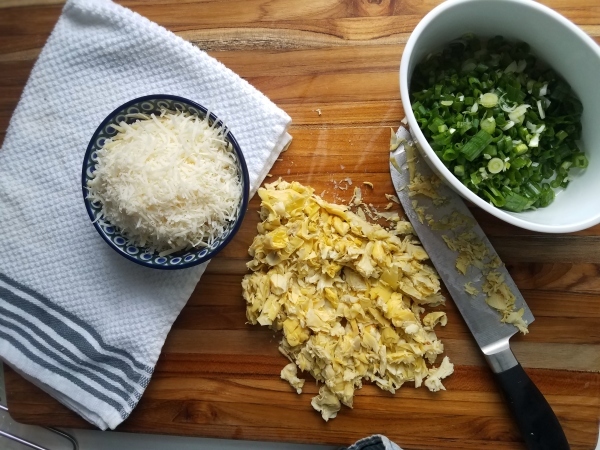 She scaled a standard quiche recipe to fit in a quarter sheet pan. I liked the idea, but wanted to make it more finger food friendly. 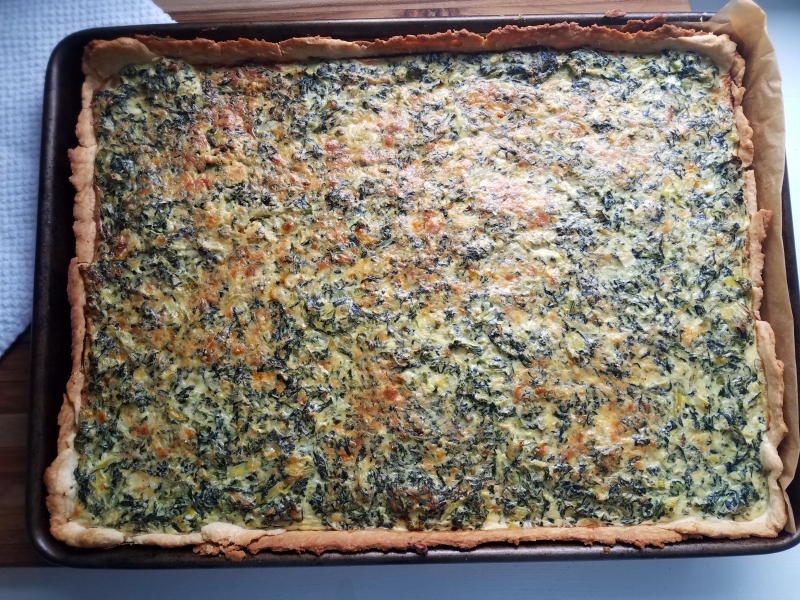 Doubling the pan size while only increasing the filling by a third creates a crust to filling ratio of about 1 to 2, which means the quiche can easily be eaten as a hand held. 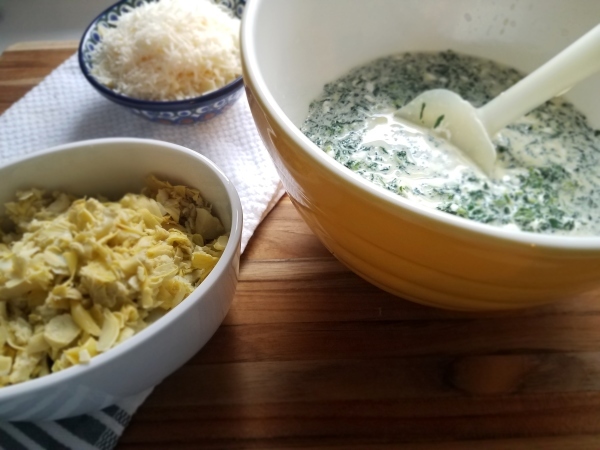 I also added artichokes, to give it a fun spinach and artichoke dip vibe. This recipe is great for holiday entertaining because quiches are delicious warm or at room temperature and travel well. I made it for a party last week and it was a hit! In a food processor, blend together the flour, salt, and butter by pulsing the machine until the butter is reduced into crumb-sized bits. I like to put a sheet of plastic wrap between the lid and the bowl while pulsing c to keep the flour from making a mess of the food processor lid (which I find hard to wash). Once flour and butter are crumbly, add in water and pulse machine, stopping when the dough has balled. This should only take the few seconds. Wrap dough in plastic and set in freezer to quick-chill until firm but not hard, about 15 minutes. You can also chill it in the fridge, but that will take longer (at least an hour). Lightly coat a rimmed half sheet pan with oil. Line bottom with parchment paper. 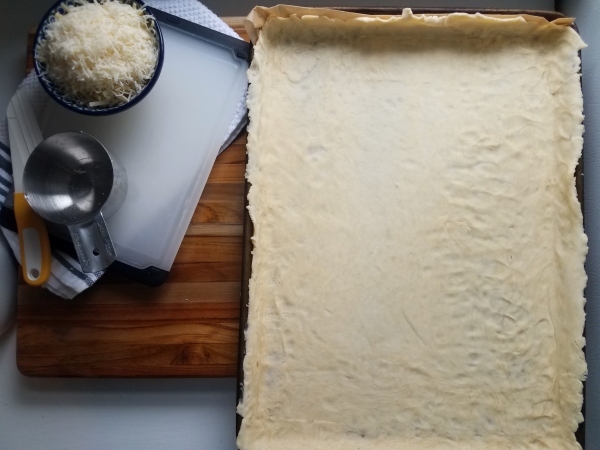 Once chilled, press dough into the pan in an even layer across bottom and up the sides of the pan. Leave the sides a bit thicker and let the dough extend slightly over the edge of the pan -- it will shrink a bit while baking so you want to compensate for that. Keep any extra dough you have, you can use it to repair your crust if it has cracks after being parbaked. Put the dough back in the freezer until solid, about 15 minutes. Meanwhile, heat oven to 425 degrees F.
Coat a large sheet of foil lightly with baking spray. Once the crust is solid, prick it all over with a fork and press foil, oiled side down, against dough. Top the foiled crust with pie weights or with an even layer of sugar (the sugar will get toasted during the parbake but can be reused in recipes!). Bake for 20 minutes, remove from over, and gently peel off pie weights and foil. Squeeze out spinach to remove as much extra moisture as possible. 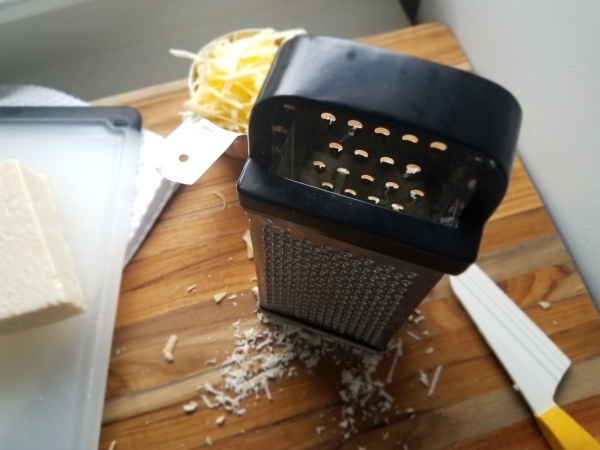 A cheesecloth works well for this, as does a fine mesh strainer, but you can also just squeeze it out over the sink. Set spinach aside. Using an electric mixer, beat cream cheese in the bottom of a large bowl until smooth and fluffy. Drizzle in half-and-half, whisking continuously so the mixture blends smoothly. Whisk in eggs, two at a time, until combined. Stir in spinach, artichokes, cheddar, parmesan, scallions, salt, and pepper. When crust is parbaked, leave oven on. Check crust for cracks or holes and use extra dough to patch them if necessary. Pour in filling just to the top of the crust. If you have extra filling (I didn’t, but your baking sheet might be smaller or shallower) you can bake if off in a separate oven safe container for a tasty breakfast. ​Bake quiche until crust is golden brown and filling is set, about 25 minutes. Cool at least 10 minutes before serving. Quiche keeps in fridge for 4 to 5 days and freezes well.